Rio is a great city filled with lots to do. Here is a list of things that you will definitely experience staying in the city. The napkins are like wax paper, basically they are non-absorbent…which completely defeats the purpose of a napkin. This is problematic when eating any of the fried snacks commonly found at small street shops, like Wes’ favorite, a coxinha (english translation is little chicken thigh). The napkins are much smaller than a typical napkin found in the US and have an almost crunchy feeling. I find myself using at least 15 of them during a basic meal. Next to every toilet you will find a small trash can (some with lids & some without), which come to find out are for used toilet paper. Most bathrooms found in restaurants and other public places will display signs reminding customers not to throw toilet paper in the toilet, but to use the trash can instead. 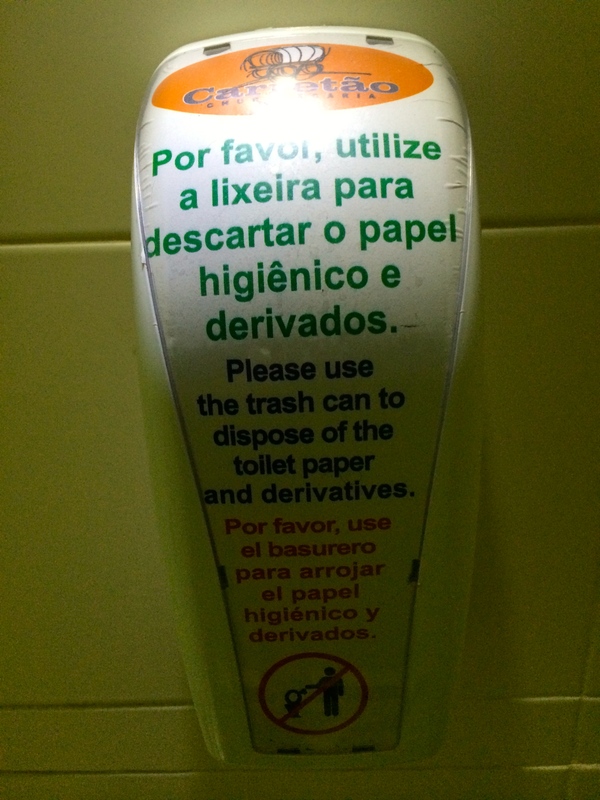 From what I have gathered, the sewage systems in Rio can not cope with large amounts of toilet paper and can get clogged easily. Even after seeing the signs & the trash cans overflowing with used toilet paper, I repeatedly forgot and threw my toilet paper straight down the toilet. Oops…I hope I didn’t cause to much damage. Rio is a massive city with more than 6 million people and therefore the traffic is absolutely insane. With people traveling from all over the world for the World Cup, Rio is crammed with tourists and the traffic is expenentially worse than usual. We have avoided the traffic as much as possible, but did spend almost 45 minutes stuck in bumper to bumper traffic on the President Costa e Silva Bridge (the bridge connecting Rio to Niteroi), which is approximately 8-miles. People are extremely affectionate in Rio and are not afraid to engage in passionate make-out sessions in any/all public places. It is a very common scene to find two people stopped on the side walk with their lips locked and hands all over each other. It was a bit alarming at first, but I have grown to appreciate this open and free expression of love. Getting cash out of the ATM’s on the weekend has proven to be a difficult task. After numerous failed attempts over this past weekend, I gave up. On Monday morning I headed to the bank once again and found a line of frustrated customers out the door. I waited in line for at least 20 minutes, navigated my way through the ATM screens and finally got some cash. I spoke with someone at the bank who spoke English and he explained to me that they fill the ATM’s with cash on Friday and then not again to Monday. Lesson learned, don’t try to withdrawal cash on the weekends. I have eaten at least 5 different kinds of cereal over the last couple of weeks and not because I wanted to try a new kind each time I went to the grocery store. But because every time I went to the grocery store I found that they didn’t have the brand/flavor that I had bought the previous time. They never seemed to keep the same things stocked, which was disappointing because just when I found something I liked, I never saw it again at the store. 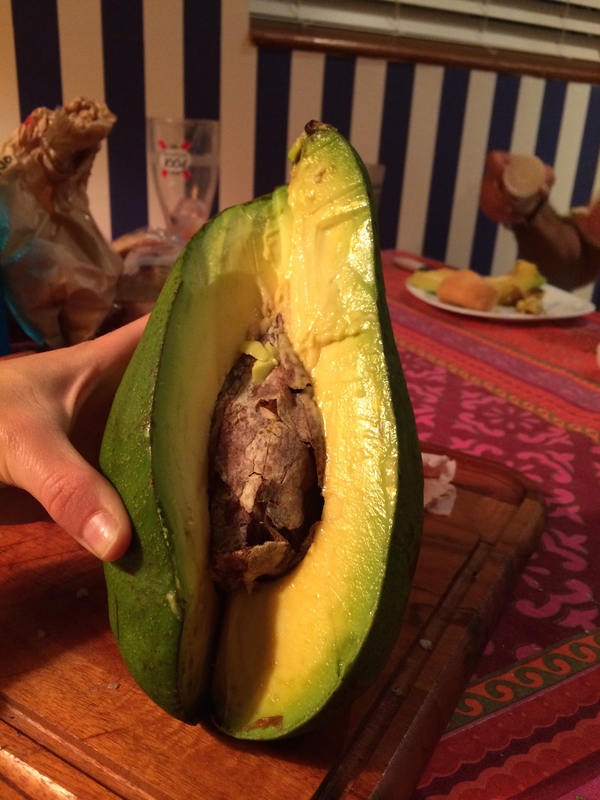 Additional things…the avocados are massive and absolutely delicious, the price of wine and ice cream (2 of our favorite things) is extremely high. People in Rio like to show off their butts (bundas), men and women both. 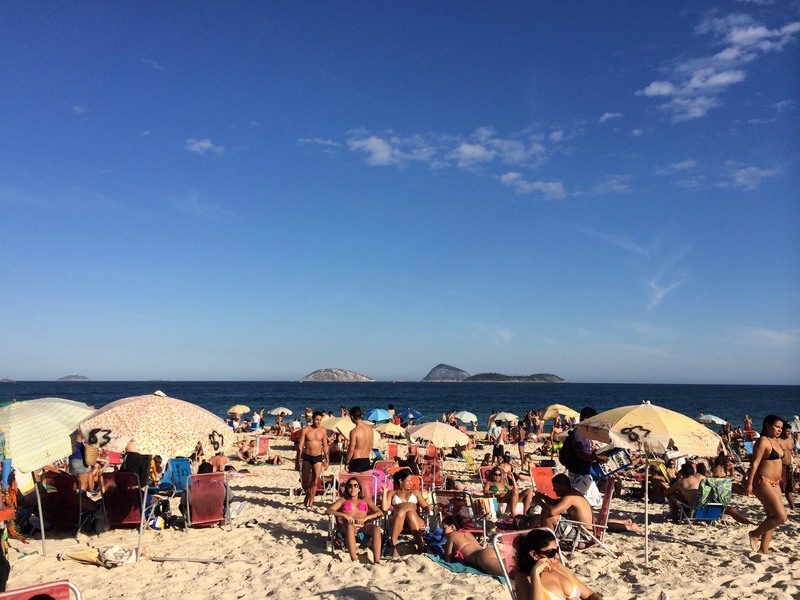 Women wearing Brazilian bikinis (extremely small bottoms, variations of a thong) and men wearing a version of what we refer to as a speedo (sunga), line the beaches. People are extremely comfortable with their bodies and really just let it all hang out. It doesn’t matter what shape or size you are, the swim suits are teeny tiny. It is even common to see men leaving the beach to walk back to their apartment in just their sungas. Needless to say I stuck out like sore thumb…with my full coverage bikini bottom, blond hair, blue eyes and pale skin! 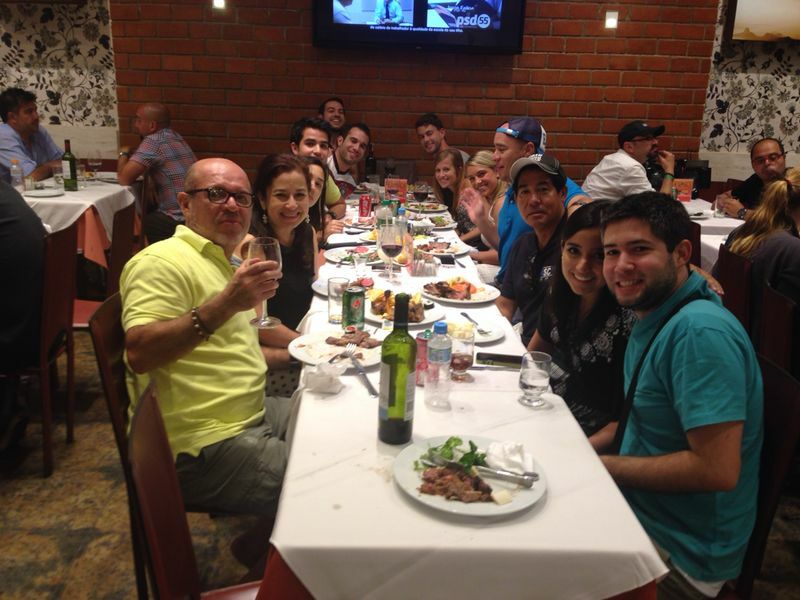 There are small restaurants/bars everywhere in Rio, most with a small inside space with a few tables and then a few additional tables outside. There are often tiny, taller tables lining the edge of the bar that people can stand at while they drink their beer. But when you arrive at one of these small bars on a Friday or Saturday night or when Brazil is playing, you will find a street party has formed. It is legal to drink alcohol on the streets, so everyone grabs a drink and just stands in the street. In addition, there is no music playing. There are rules about noise after 10pm in many neighborhoods and so you rarely find music. One night there were actually people throwing eggs out the window at people playing the drums in the street. We have yet to find good service in a restaurant. Bare in mind we are not eating in 5-star restaurants but we have eaten at a few nicer places. After you sit down at most restaurants you have to flag down a waiter to take your order. They bring you your drinks and food, but don’t check back to see if you need anything else or if everything is going alright. This never was really a problem for us, because we were never in a hurry and our group was extremely laid back…it was just kind of comical. The people in Rio are wonderful. Everyone that we have met has treated us with nothing but kindness. The bus drivers were so helpful and kindly directed us to what bus we should be taking. Random people that we met helped us with suggestions of restaurants and other places to go. Even the man at the meet counter at the grocery store smiled and helped me order turkey several times. Our friend’s family welcomed us with open arms at their farm and the people we are renting the apartment from sent us suggestions of restaurants in neighborhood & helped us reserve a taxi to the airport. The people in Rio make this beautiful city even more special than it already is. This was fabulous to read – you can really get a sense of the culture and people from what you wrote Katie! Love the blog! Love it! Have you tried Cashew Juice yet? It was quite unique, but I really loved it. Also, when my college jazz band visited Brazil, you could always find our group on the crowded beach because we were a) very pale, and b) over-dressed for the water!